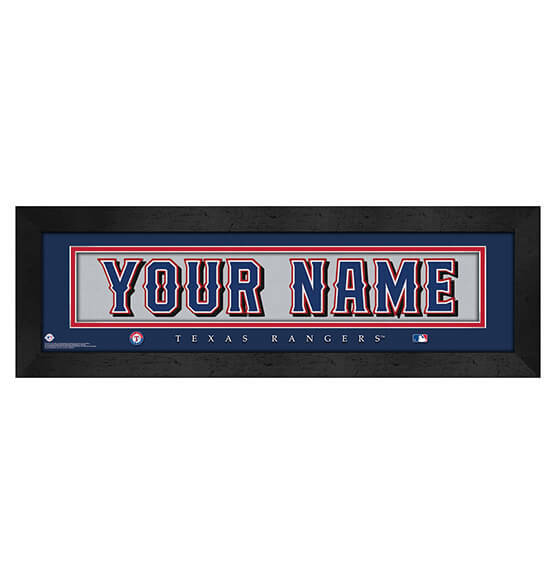 With its vibrant team colors and vintage Rangers design, this Texas Rangers Personalized MLB Nameplate Framed Wall decor will look great in your fan cave. Easily customizable up to 12 characters, this premium custom sports decor will help cement your number-one fan status all season long. With a horizontal perspective, high-quality glass and crisp, vibrant printing, you can't go wrong with this personalized nameplate. Whether it's purchased as a gift or for your very own home or office, this ready-to-hang addition to your baseball fan art is guaranteed to be a round-tripper!